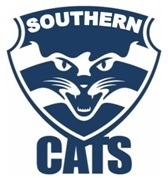 Southern Cats Season 2018 Shaping Up! The club is pleased to announce that we have confirmed Adam Asanovski as the head coach of the Southern Cats for the 2018 season! Adam will be continuing on from his great work during his inaugural coaching year in 2017, where the Cats made it to the preliminary finals and to within 2 goals of a grand final berth! Regular season training has finished for the season but is usually every Tuesday and Thursday at Isabella Plains Neighbourhood Oval, at 6:30pm. Players should get there earlier and be warmed up and ready to get stuck into it. All are welcome to come and support the team! Official pre-season training for 2018 will be begin in late January, but some of the group have already begun unofficial sessions so contact the club if you would like details.